It could be that the prayers of iOS gamers everywhere are about to be answered. That's right: Apple might be going to support gamepads working with iOS devices. Update: Not quite. A patent uncovered by GameRevolution today details a method for an iPhone to learn and mimic the commands of other devices. One diagram shows a Dualshock-style controller communicating with iOS devices connected via RFID or near-field communication protocols. This looks like it might be related to speculation from a few months ago that Apple was working on a dedicated controller. Text from the patent talks about this method allowing for control of a "standalone media controller" or video game system. The Apple TV settop box already allows for wireless streaming of iOS games from an iPad or iPod touch, so it could fill either one of those descriptions. The patent is also a sign that Apple could be planning to implement NFC technology in its next wave of products, as the document reveals a vision of iDevices controlling various appliances in a connected-home scenario. So, a game controller wouldn't just let you steer Batman around Gotham City. As with all things Apple and patent-related, what is spelled in the document may not actually come to pass. But, this patent could be crucial in making Apple TV an attractive video game console alternative. For a certain audience, anyway. 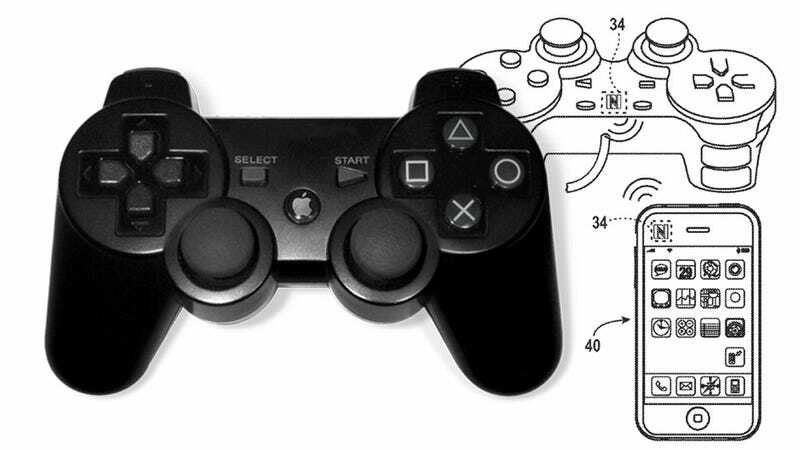 Correction: This story originally stated that Apple had patented a controller of its own. It was then edited to reflect that Apple was working on allowing third-party controllers to connect to its devices. The document in question actually involves Apple devices mimicking the functions of existing game controllers to be used in their stead. The article has been updated to reflect this information. We regret the error.